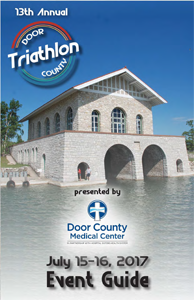 The 2017 Door County Triathlon Event Guide is now available online. Printed copies of the guides will be distributed to participants, volunteers and spectators on race weekend. Click here or on the image to the right to download the Event Guide in PDF format. An overview sheet of the Door County Medical Center Kids’ Triathlon will be posted separately and available in printed format on race weekend.